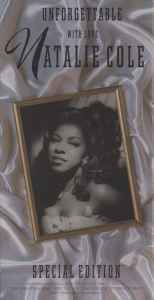 This special edition features the full length CD Unforgettable With Love in which Natalie Cole sings twenty two Nat "King" Cole classics. It also includes the bonus CD single "The Christmas Song" and the video singles "Unforgettable" and "The Christmas Song" on one VHS videocassette. CDs: Made in U.S.A. by WEA Manufacturing Inc.
Video: Mfg. by Elektra Entertainment, a Division of Warner Communications Inc., a Time Warner Company. 75 Rockefeller Plaza, New York, New York 10019, 345 North Maple Drive, Beverly Hills, California 90210. All rights exclusively licensed to Elektra Entertainment. ©1991 Elektra Entertainment, a division of Warner Communications Inc.